Here’s a question. What’s the easiest way to distinguish Burmese monks from their counterparts in other countries? Typically, it’s from the color of the robes. Burma is unique among Theravada Buddhist countries in one respect: the color of monk robes. While Cambodia, Thailand, Laos and Sri Lankan monks don robes dyed in bright saffron hues, Burmese monks typically dress in drab maroon or burgundy-colored robes (aside from a few outliers). Tibetan monks in maroon robes. Via Flickr (@wonderlane). Konbaung era painting shows Buddhist monks dressed in yellow robes. However, I came to discover that this wasn’t always the case. In fact, the switchover to maroon as the preferred color choice of Burmese monks appears to be fairly recent, largely occurring in the last few decades. For instance, paintings and artwork commissioned during the Konbaung dynasty, the last Burmese dynasty, show monks dressed in bright yellow robes. Another Konbaung era painting depicts Buddhist monks dressed in saffron robes. 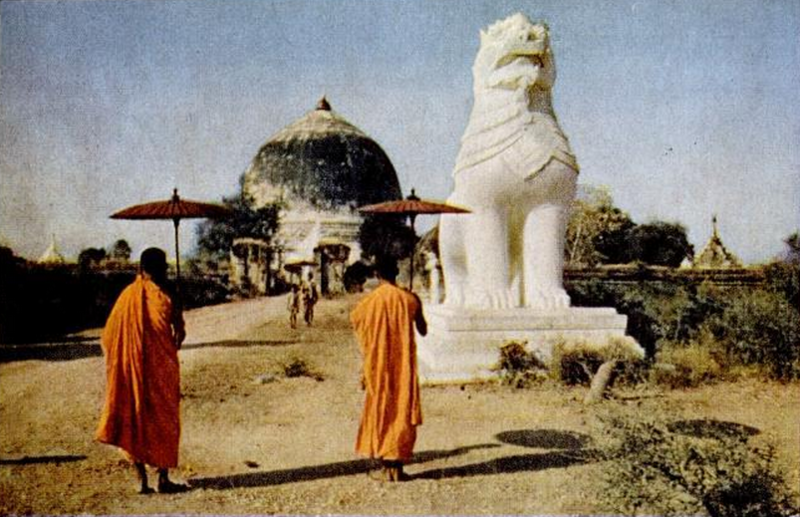 As late as the 1950s, color photos of Burmese Buddhist monks show them dressed in bright saffron colored robes, similar to those worn by other Southeast Asian monks. A photo of my grandmother (conveniently cropped out) offering maroon robes to a Buddhist monk in the late 1970s. 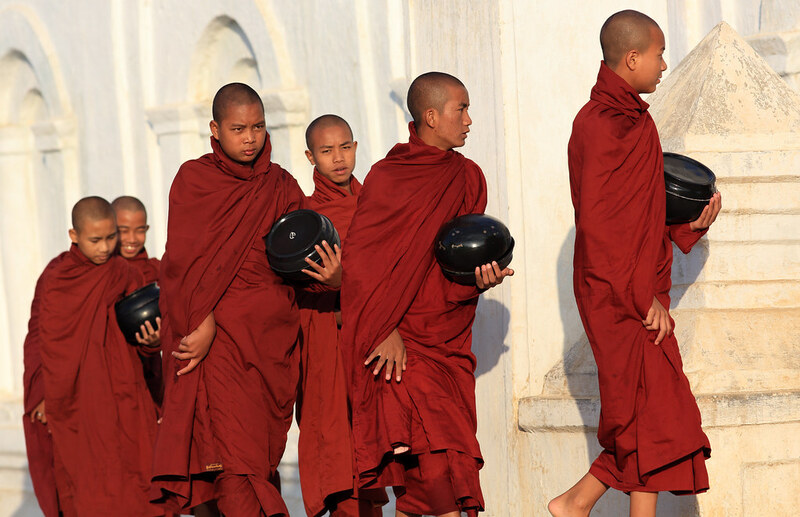 Yet by the 1970s, most Burmese monks were sporting maroon colored robes. For instance, in a late 1970s photo of my grandmother donating monk robes, one can readily see a pile of maroon robes. Also, all of the monks in the photo are dressed in burgundy hues. So what gives? Burmese monks in maroon robes. Via Flickr (@Dietmar Temps). Perhaps this is simply the result of a conscious decision made by Burmese companies that manufacture the monk robes. One little known fact is that the majority of Burmese monastic robes are now manufactured in large batches by a handful of large factories, not woven by individual donors. Brand names like Zawtika, Galone, and Thamada now dominate the domestic market. Traditional weaving of monk robes, a laborious process, has largely been confined to ceremonial festivals and competitions (like the Shwedagon matho thingan (မသိုးသင်္ကန်း) robe weaving competition). Or perhaps the Burmese interpretation of the Vinaya’s regulations governing a monk’s robes has changed in recent years? In any case, if anybody knows, please shed some light. I’ll be interested. Misguided generosity: should the Burmese donate differently? I would like to comment on this if I may. Ludu Daw Hla’s book Mandalay Thu includes some details of the evolution of the monk’s robes in Burma. Traditionally the robes were made from pieces of clothes dyed with the barks of jackfruit which imparts a distinct bright yellow colour. These robes were not colour fast and the monks and the novices hands and artcles were rendered yellow. The monks have to endure this problem. Also most of the elder monks do not prefer the bright yellow bright are partial to more somber darker colour. This cam be obtained with many sessions of dyes and sometimes with the aid of “madama barks”. Then in the Burmese era 1300 U Saing of Mandalay started importing “Holland” fabrics which are already dyed and are color fast. They were very popular and U Saing goes one step further by dyeing an additional colour to make it more darker. From then on Maha Bandoola robes produced by U Saing stayed in the top position until nationalised. Very interesting. Thanks for shedding some light on this, MHK! I am a subscriber to your blog and enjoy dipping into past posts. The saffron robes referred to in nearly all my reading on Burma had me really confused after seeing the maroon coloured robes actually worn. I asked people both times I have visited Burma, but they said the robes had always been maroon. I knew there must have been an official change at some point, but your grandmother’s picture pointing to the change occurring sometime by the 1970’s makes me think it might have been a conscious decision by the Ne Win government, rather like his arbitrary decision to switch from driving on the left to driving on the right. The people I asked were too young to know this, so next time I will try to find someone older to ask. Thanks for subscribing, Sharman! That’s certainly a plausible explanation. Perhaps the 1970’s, as the country receded into deep isolation, made it hard for monk robe manufacturers to access the dyes they needed. Intereresting article. By the way, do you have any information about the “thousand-patch” saṅghaṭī? I’ve heard that it is unique to Burmese tradition. Theravada monks’ robes usually are sewn in five columns (khaṇḍa), irrespective of whether it is lower robe (antaravasaka), outer robe (uttarasaṅga), or saṅghaṭī. I read somewhere that it is permitted to make robes with more columns: seven, nine, but not exceeding eleven. In practice this is rarely done. Robes with many columns are more common within other traditions (e.g. Tibetan, Chinese). Burmese is an exception that — if I’m not mistaken — twenty-five columned saṅghaṭī is not uncommon to be found. And then there is the “thousand-patch” one. Do you ave any information? Bandoola U Saing of Mandalay was practiaclly the sole purveyor of monk’s robes (thingan) in pre- and post-war Burma, and a friend of Ludu Daw Amar (U Hla was her husband). So MHK was almost certainly right as Daw Amar’s research involved a primary source.